Redgate SQL Prompt Core is free for Visual Studio Enterprise 2017 only. 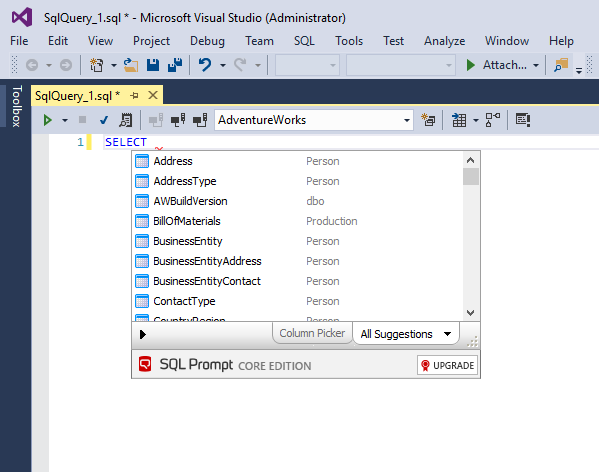 Get SQL Prompt Pro for all other editions of Visual Studio. SQL Prompt Core is a free extension for Visual Studio Enterprise, which improves your productivity with advanced IntelliSense-style SQL code completion. For more information, visit the Redgate website or SQL Prompt Pro documentation. SQL Change Automation for VS2017 or SQL Change Automationfor VS2015 – develop, source control, and safely automate deployments of database changes alongside application changes. SQL Search – speed up database development by quickly searching for SQL objects and exploring across SQL Server databases.